This tractor is used for harrowing, bog supervisory transport and bog service. 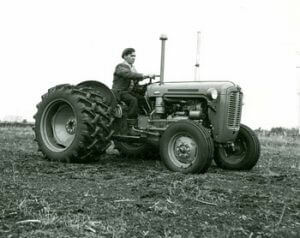 The tractor is essentially a standard agricultural type with additions to suit their application to milled peat production. For harrowing, a proprietary half band track is fitted over the standard rear wheels, with an additional rubber tyred jockey wheel. Special dust guards are fitted over these tracks. The front wheel tyres are slightly larger than standard and the engine exhaust pipe is projected upwards to minimise fire risk. For supervision and service, the standard rear wheels are doubled, while the front wheels and engine exhaust pipe are as for the harrow tractor.